GSGS, Global Sourcing and Global Sales, is Atomy’s unique strategy for striving to become a global hub of distribution. Products that meet the company’s Absolute Quality Absolute Price standard are sourced and sold around the world through Atomy’s global sales network. 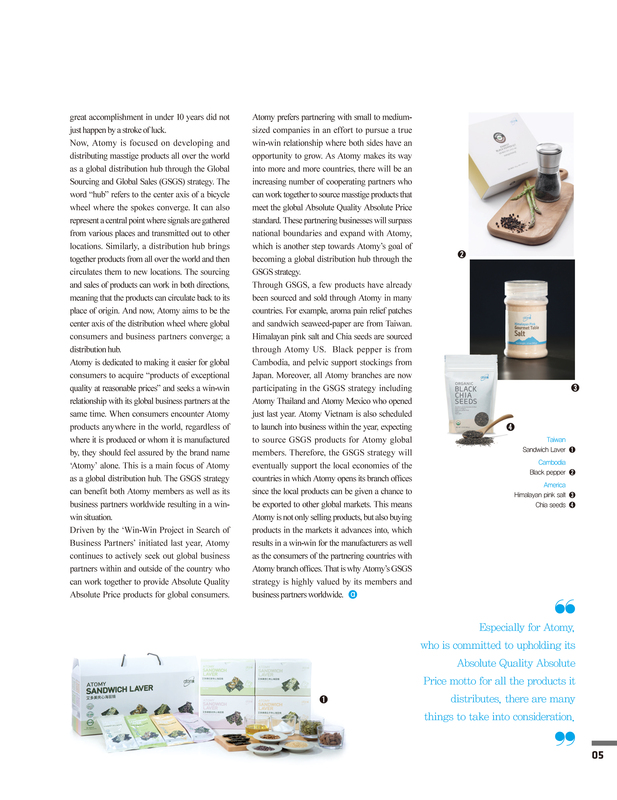 These products, regardless of country of origin, are distributed from suppliers to consumers based on buyer demand. This is a goal of Atomy which aims to become a global distribution hub by implementing the GSGS strategy. Where there is consumer demand, distribution of products may occur naturally. But from the corporate point of view, this is not always an easy task to accomplish. Especially for Atomy, who is committed to upholding its Absolute Quality Absolute Price motto for all the products it distributes, there are many things to take into consideration. For example, in an effort to maintain masstige quality for all the products that cross the borders, Atomy has to afford the increasingly high cost of market research. This increase in cost is often a big burden for a company that starts doing business abroad since the costs can easily outweigh the benefits. However, Atomy has strong confidence to overcome these challenges. During the last decade, consumers in Korea as well as abroad have witnessed with their own eyes that Atomy never fails to stand by its Absolute Quality Absolute Price standard, which in turn has resulted in a strong sense of trust by more than 4 million loyal members worldwide. And this great accomplishment in under 10 years did not just happen by a stroke of luck. 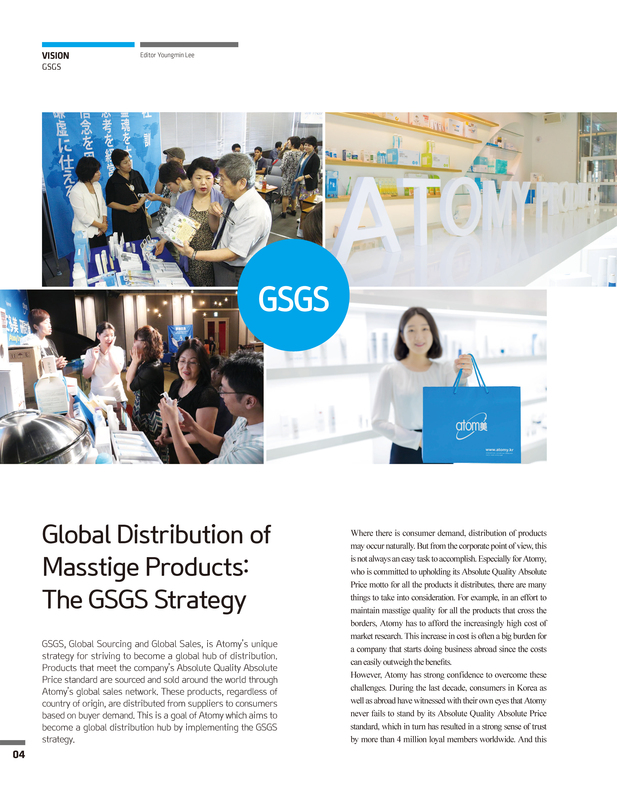 Now, Atomy is focused on developing and distributing masstige products all over the world as a global distribution hub through the Global Sourcing and Global Sales (GSGS) strategy. The word “hub” refers to the center axis of a bicycle wheel where the spokes converge. It can also represent a central point where signals are gathered from various places and transmitted out to other locations. Similarly, a distribution hub brings together products from all over the world and then circulates them to new locations. The sourcing and sales of products can work in both directions, meaning that the products can circulate back to its place of origin. And now, Atomy aims to be the center axis of the distribution wheel where global consumers and business partners converge; a distribution hub. Atomy is dedicated to making it easier for global consumers to acquire “products of exceptional quality at reasonable prices” and seeks a win-win relationship with its global business partners at the same time. When consumers encounter Atomy products anywhere in the world, regardless of where it is produced or whom it is manufactured by, they should feel assured by the brand name ‘Atomy’ alone. This is a main focus of Atomy as a global distribution hub. The GSGS strategy can benefit both Atomy members as well as its business partners worldwide resulting in a win-win situation. Driven by the ‘Win-Win Project in Search of Business Partners’ initiated last year, Atomy continues to actively seek out global business partners within and outside of the country who can work together to provide Absolute Quality Absolute Price products for global consumers. Atomy prefers partnering with small to medium-sized companies in an effort to pursue a true win-win relationship where both sides have an opportunity to grow. As Atomy makes its way into more and more countries, there will be an increasing number of cooperating partners who can work together to source masstige products that meet the global Absolute Quality Absolute Price standard. These partnering businesses will surpass national boundaries and expand with Atomy, which is another step towards Atomy’s goal of becoming a global distribution hub through the GSGS strategy. Through GSGS, a few products have already been sourced and sold through Atomy in many countries. For example, aroma pain relief patches and sandwich seaweed-paper are from Taiwan. Himalayan pink salt and Chia seeds are sourced through Atomy US. Black pepper is from Cambodia, and pelvic support stockings from Japan. Moreover, all Atomy branches are now participating in the GSGS strategy including Atomy Thailand and Atomy Mexico who opened just last year. Atomy Vietnam is also scheduled to launch into business within the year, expecting to source GSGS products for Atomy global members. Therefore, the GSGS strategy will eventually support the local economies of the countries in which Atomy opens its branch offices since the local products can be given a chance to be exported to other global markets. This means Atomy is not only selling products, but also buying products in the markets it advances into, which results in a win-win for the manufacturers as well as the consumers of the partnering countries with Atomy branch offices. That is why Atomy’s GSGS strategy is highly valued by its members and business partners worldwide.